Grievances lodged in accordance with the provisions of PPL 1.70.06b Discrimination and Harassment - Procedures must be lodged no later than 12 months from the date of the most recent incident complained of. Complainants who are considering lodging a complaint with an external jurisdiction (e.g. Anti-Discrimination Commission Queensland, Australian Human Rights Commission, Fair Work Commission, Fair Work Ombudsman) should note that specific timeframes may apply. Complainants should inform themselves of any such timeframes that may be applicable by contacting the relevant external jurisdiction directly. This policy does not apply to grievances where the subject of the complaint is a Public Interest Disclosure. In such circumstances the complainant should refer to the PPL 1.60.03 Public Interest Disclosure Policy. If the subject of the grievance is in relation to a dispute over intellectual property then the complainant should first attempt to resolve the dispute in accordance with PPL 4.10.13 Intellectual Property for Staff, Students and Visitors before engaging this policy or the associated procedures. September 2015 - update to misconduct/serious misconduct reference. June 2018 - URLs updated. These procedures enact PPL 5.70.08a Staff Grievance Resolution - Policy. These procedures apply to all professional and academic staff covered by the Enterprise Agreement and during their period of employment with the University. These procedures do not apply to staff while on secondment external to the University. For the avoidance of doubt, external secondment includes associated entities of the University. Where a grievance arises during an external secondment the staff member should follow the relevant grievance resolution policy in operation at the external entity. Implementation of these procedures will not normally be a reason to suspend other administrative processes such as annual performance appraisals, mid-term and final reviews for continuing appointment, applications for promotion or for classification or re-classification. In exceptional circumstances, and with the agreement of the complainant, the supervisor responsible for attempting to resolve a grievance, in consultation with the Director, Human Resources, may put in place a set of conditions or an alternative process to resolve a grievance at any stage and without concluding these procedures. If a complainant refers their grievance to an external authority (other than to seek advice), these procedures will cease forthwith and will not be re-activated except in circumstances where the external authority makes a recommendation to conclude the staff grievance resolution procedures. Where two or more complaints have common substance, this may be dealt with as a single grievance. At all stages of these procedures staff will continue to work in accordance with the directions of their nominated supervisor. Information and advice can be sought at any time from a member of the Human Resources Division, the Occupational Health and Safety Division and the Equity Office. Where relevant, in the first instance any party to a complaint may choose to meet with a UQ Discrimination and Harassment Contact Officer to obtain information about University policies, procedures, where to access support or advice and to discuss possible courses of action they may take to seek resolution of their grievance. Information on a range of assistance available to staff can also be found within PPL 5.70.06 Staff Assistance Services. The supervisor responsible for resolution of the grievance, in consultation with a senior representative from the Human Resources Division, may assess that health issues may be involved and may refer the complainant or respondent to his/her own medical practitioner or to the University Staff Support and Rehabilitation Officer. The senior representative from the Human Resources Division should obtain the staff member’s consent to liaise with the medical practitioner and to receive from the medical practitioner any comments which may assist in resolving the grievance or addressing issues of concern to the staff member. The University may appoint an alternative officer to attempt to resolve a grievance at any stage of these procedures. 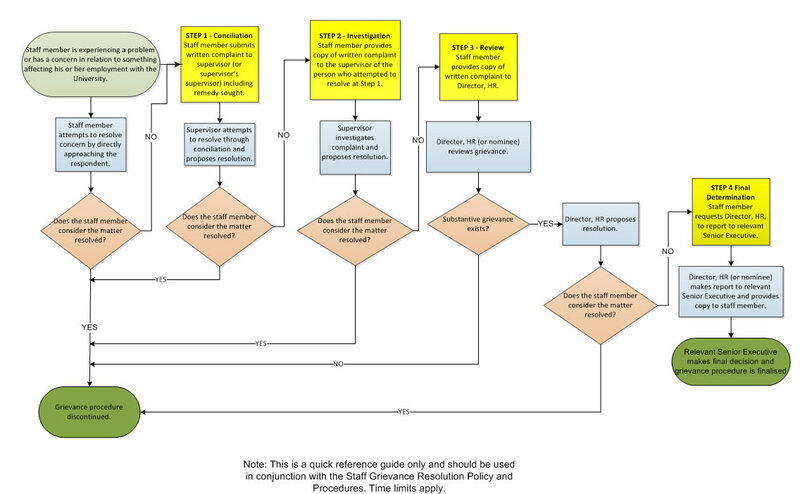 The Staff Grievance Resolution flow chart summarises the staff grievance resolution procedures but should be used in conjunction with the Staff Grievance Resolution Policy and Procedures. In the first instance, before seeking formal resolution, the complainant can attempt to seek resolution of the problem at the earliest time and with the respondent(s) directly wherever possible. This might take the form of a direct approach in person or if face to face contact is not possible or appropriate, in writing, carefully and clearly stating the nature of the concern and what a preferred outcome might be. The aim is to reach an acceptable outcome that minimises any potential detriment to ongoing workplace relationships. Only where informal resolution is not possible or appropriate, should the process move to Step 1 - Conciliation. Both the complainant and respondent are entitled to be represented by a representative at each step of the formal resolution procedures. The preferred remedy to resolve the grievance. The Staff Grievance Resolution Form, along with any associated supporting documentation, can be submitted to the complainant’s supervisor or, where the complainant’s supervisor is the subject of the complaint, to the complainant’s supervisor’s supervisor. Once in receipt of a completed Staff Grievance Resolution Form, the supervisor will assess the complaint to ascertain whether it can be dealt with under these grievance resolution procedures, or whether the complaint can be dealt with through another more suitable process. Where it is considered by a supervisor responsible for grievance resolution (in consultation with the Human Resources representative) that the alleged actions or behaviours which constitute the grievance may amount to misconduct or serious misconduct as defined in the Enterprise Agreement, the matter will be addressed in accordance with the Enterprise Agreement. Where a matter is one of a potentially criminal nature, this will be referred to the Director, Human Resources who will determine whether the police or other relevant authority should be notified. Determine an appropriate course of action to resolve the grievance/matter. No investigation will be conducted at this stage - the supervisor will make preliminary enquiries and conciliate with the parties focussing on establishing a set of conditions to resolve the grievance. The supervisor responsible for resolving the grievance will not provide a copy of the Staff Grievance Resolution Form to the respondent but can provide the relevant details of the complaint to assist the conciliation process. The supervisor will inform the parties of the proposed set of conditions to resolve the grievance, which will only be implemented with the agreement of the parties. The supervisor responsible for resolution of the grievance must ensure that appropriate steps are taken to implement the agreement and to monitor the situation to ascertain both the effectiveness of this remedial action, and that victimisation of either the complainant or respondent does not take place. If agreement on a resolution is reached then this will be recorded by the supervisor on the Staff Grievance Resolution Form. A copy of the completed Staff Grievance Resolution Form confirming the agreed outcome will be provided to the complainant. If agreement cannot be reached then the supervisor will record this on the Staff Grievance Resolution Form. A copy of the Staff Grievance Resolution Form will be provided to the complainant and they will be advised of their right to have the matter investigated at step 2. Irrespective of whether an agreement has been reached, the respondent will be written to separately by the supervisor responsible for the grievance resolution confirming the outcome of the grievance at this step. The supervisor responsible for attempting to resolve the grievance will, wherever possible, propose a set of conditions to resolve the grievance within four weeks of the lodgement of the grievance at step 1. If the complainant believes that the grievance has not been resolved at step 1, they may request that the matter be investigated at step 2 within 10 working days of the date of correspondence confirming the outcome of step 1. Clarify in writing the remaining concerns if the grievance has been resolved in part at step 1. The supervisor responsible for resolving the grievance will not provide a copy of the Staff Grievance Resolution Form to the respondent but will provide the relevant details of the complaint to enable the respondent to respond in accordance with the principles of procedural fairness. In consultation with a senior representative from the Human Resources Division, the supervisor responsible for resolving the grievance can conduct or commission an investigation. The investigation will include a meeting with the complainant to clarify the details of the grievance and then with the respondent(s) (separately) in order to gather information as required to assist with the investigation and determination of the grievance. The person investigating the grievance can also meet with any other relevant person including the supervisor responsible for resolving the grievance at step 1. Where a supervisor conducts an investigation, a representative from the Human Resources Division should be present at investigation interviews to provide advice to the supervisor responsible for resolving the grievance and, where appropriate, provide information to the parties on the grievance resolution procedures. At the conclusion of the investigation, the supervisor responsible for resolving the grievance will meet with the parties (separately) and advise them of the investigation findings and seek agreement from the complainant on the proposed set of conditions to resolve the grievance. The supervisor responsible for resolution of the grievance will ensure that appropriate steps are taken to implement any agreement reached and to monitor the situation to ascertain both the effectiveness of this remedial action, and that victimisation of any party does not take place. If agreement cannot be reached then the supervisor will record this on the Staff Grievance Resolution Form. A copy of the Staff Grievance Resolution Form will be provided to the complainant and they will be advised of their right to have the matter reviewed at step 3. The respondent will be written to separately by the supervisor responsible for the grievance resolution confirming the outcome of the grievance at this step. Investigation and determination of the grievance at step 2 of the grievance resolution procedures will be completed without unreasonable delay and as soon as reasonably practicable. If the complainant wishes to progress the grievance to step 3 then they must do so within 10 working days of the date of correspondence confirming the outcome at step 2. In extenuating circumstances the complainant may make a written request to the Director, Human Resources for an extension to this timeframe. Clarify in writing the remaining concerns if the grievance has been resolved in part at step 1 and/or step 2. It will be open to the Director, Human Resources (or their nominee) to find that no substantive grievance exists and to direct the complainant accordingly and discontinue these procedures. Where a substantive grievance exists, the Director, Human Resources (or their nominee) will review the proposed conditions to resolve the grievance and determination made at step 2 of the grievance procedure (and associated documentation) and attempt to resolve the grievance. In undertaking a review of the grievance the Director, Human Resources (or their nominee) will not be bound by the rules of evidence but may be informed on any matter in such manner as they think appropriate and as the consideration of the matter before them permits. Provide the complainant with an opportunity to clarify any matter regarding the grievance. Provide the respondent with an opportunity to clarify any matter regarding the grievance. The Director, Human Resources (or their nominee) will consider any representations made by the complainant and respondent either orally or in writing or through a representative. Access and review all relevant records of evidence and submissions. At the conclusion of the review, the Director, Human Resources (or their nominee) will seek agreement from the complainant on a proposed set of conditions to resolve the grievance. The Director, Human Resources (or their nominee) will ensure that appropriate steps are taken to implement any agreement and to monitor the situation to ascertain both the effectiveness of this remedial action, and that victimisation of any party does not take place. If agreement on a resolution is reached then this will be recorded by the Director, Human Resources (or their nominee) on the Staff Grievance Resolution Form. A copy of the completed Staff Grievance Resolution Form confirming the agreed outcome will be provided to the complainant. If agreement cannot be reached, the Director, Human Resources (or their nominee) will record this on the Staff Grievance Resolution Form. A copy of the Staff Grievance Resolution Form will be provided to the complainant and they will be advised of their right to have the proposed remedy finally determined at step 4. The respondent will be written to separately by the Director, Human Resources confirming the outcome of the grievance at this step. The Director, Human Resources (or their nominee) will review the grievance and propose a set of conditions to resolve the outstanding concerns without unreasonable delay and as soon as reasonably practicable. If the complainant wishes to progress the grievance to step 4 then they must do so within 10 working days of the date of correspondence confirming the outcome of the review at step 3. If agreement cannot be reached at step 3, the complainant may request that the Director, Human Resources (or their nominee) provide a report to the relevant senior executive seeking a review of the proposed resolution of the grievance. The complainant will receive a copy of the report and will be provided with a period of 10 working days in which to provide to the relevant senior executive for their consideration additional written representations giving reasons why the proposed resolution is unacceptable. The relevant senior executive will either determine that the proposed resolution is appropriate and conclude the matter or make recommendations for alternative resolution of the grievance. This determination will be final and will conclude these procedures. The relevant senior executive will record the outcome on the Staff Grievance Resolution Form and confirm their final determination. A copy of the completed Staff Grievance Resolution Form confirming the agreed outcome will be provided to the complainant. The respondent will be written to separately by the relevant senior executive confirming the outcome of the grievance at this step. The relevant senior executive will make their final determination without unreasonable delay and as soon as reasonably practicable. In a situation where irreconcilable differences between two members of staff affect work performance, staff well being or efficiency, following reasonable attempts at reconciliation (which may have occurred prior to grievance resolution procedures being instigated), the Director, Human Resources and the staff member(s) concerned may agree to a transfer of the staff member. Any transfer should be to an agreed position for which the staff member is reasonably qualified, at the staff member’s current substantive classification level and unless specifically agreed, should not require a change to the staff member’s base place of employment. A transfer may be initiated by the University or requested by a staff member however, there is no entitlement to a transfer to an alternative position. When a transfer request made by a staff member is agreed to by the Director, Human Resources, the transfer search period will be for 25 working days with consideration of the Christmas/New Year period where applicable. The transferee will not be required to compete against external or internal applicants (other than staff who are being redeployed or transferred pursuant to a relevant provision within the Enterprise Agreement) in open competition, however, they will be required to meet the requirements of the position including selection criteria, or be capable of meeting them within a three-month period. The University will notify the staff member of possible transfer opportunities. The staff member must also notify Human Resources of positions for which they wish to be considered. Where a grievance is formally resolved at Steps 1, 2, 3 or 4, all material related to the grievance and its resolution will be held on a confidential staff file for a minimum of seven years in accordance with PPL 1.60.04a Records Management – Policy. Please refer to PPL 5.70.08 Staff Grievance Resolution - Policy and Procedures before completing this form.